If you’re interested in cooking with local flair, then you won’t want to miss Season 3 of Around the Farm Table, hosted by Inga Witscher, on Wisconsin Public Television. Part local farm-interest show and part cooking show, the Witscher family began Around the Farm Table as a series of Web episodes on Vimeo, complete with original music. PBS affiliates and PBS Food picked up the series in the second season and we’ve seen Inga visit farmers all across Wisconsin, wearing whimsical aprons and fantastic hats ever since. Her playful personality and charm helps her guests, traditionally modest Midwestern farmers, to open up about their work, and makes an informative show engaging and fun to watch. 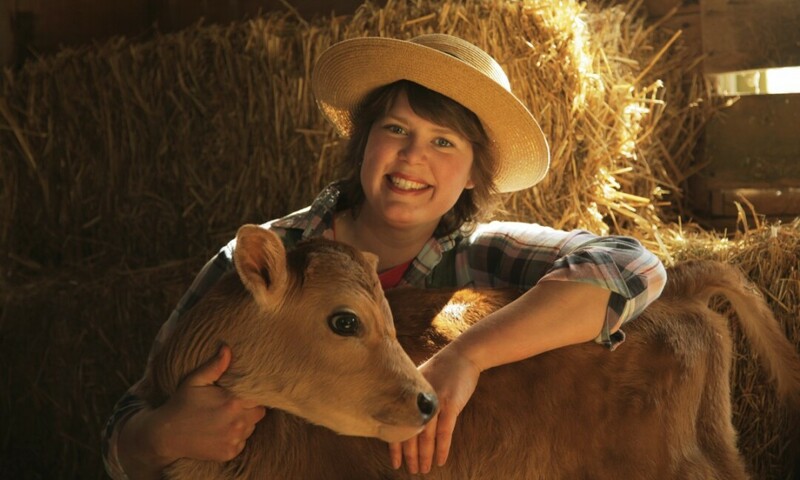 The format of the show is this: Inga visits a variety of farms around Wisconsin that are not only growing ingredients with amazing flavor but are also adding value to their farms by turning their ingredients into delicious local foods. A the end of each episode Inga cooks the ingredients or combines the products from each farm into a beautiful meal, using heritage recipes and traditional techniques that let the flavor of the foods speak for themselves. In the Season 3 premier episode, “Shooting Breakfast,” which aired Oct. 1, Inga puts together a British-inspired breakfast. To do this, she visits the Bullfrog Fish Farm in Menomonie and picks up smoked trout fillets. While she’s there she chats with David Sundal about how the fish farm works, and with owner Herbie Radman about the history of the farm and what they’re up to now. Radman offers more than just pond-side trout fishing at the farm. In addition to smoked trout fillets there’s smoked trout spread (delicious! ), fish seasonings, gift boxes, hats and shirts for sale, as well as custom fish smoking, group outings and educational tours, seasonal Hoots & Happenings, and more. At the end of the episode Inga shows us how to make cooked greens with bacon and a Wisconsin-inspired version of Kedgeree, a traditional English breakfast dish. She turns the ricotta cheese into a lovely cheese and berry dessert. As Season 3 progresses, we can expect to see such epicurean delights as quail eggs, lard from an Amish farm, locally made flour, rhubarb from Frank Lloyd Wright’s Taliesin estate, sheep’s milk cheese from a new creamery, and homemade ice cream. We’ll also meet a farmer who not only plays in a band and advocates for the Wisconsin Farmers Union (an underwriter of the show) in her spare time, but also travels to Washington, D.C., lobbying for support for small farms and addressing rural issues. In addition to local people and ingredients, Around the Farm Table brings attention to the aspects of farm and environment health that are important to growing and creating such wonderful fare, such as soil health, milk testing, holistic veterinarian, care and manure management. In “Shooting Breakfast” we meet Lyle Schlomer, an organic crop farmer who talks with Inga about the difference between feeding her herd of Jersey cows baled or dry hay. Season 3 will also touch on farm-visit etiquette. While robust interaction between consumers and farms is integral to our health as a vibrant local-foods community, it’s important to remember that the farmers are, in fact, working. You’ll want to make sure the experience is a good one for everyone by observing a few simple rules. Around the Farm Table airs on Wisconsin Public Television’s flagship channel (that’s WHWC Channel 28 in the Chippewa Valley) at 7:30pm Thursdays and 5pm Sundays; for a full schedule visit wptschedule.org. You also can watch full episodes from all three seasons, get the recipes, and learn more about the Witscher family farm, St. Isidore’s Mead, by visiting www.aroundthefarmtable.com.